Sure, summertime cocktails can be fancy, decked out with little paper umbrellas and citrus garnishes. But when the mercury rises, fiddling with froufrou can get annoying. All you really need for a cooling, refreshing summer cocktail are the basics: alcohol, mixers, and, usually, ice. Mint leaves and the like are nice extras, but they're extras. And keeping the alcohol low and the mixers high (what's known as a long drink) will prevent you from getting too sloshed too fast — not fun in the summer sun. Here are eight alcohol-plus-mixer cocktails for beating the heat. #(clear n1). Kir. This classic French aperitif is usually made with blackcurrant liqueur as well as white wine, but you can lower the alcohol content by using blackcurrant syrup instead. Splosh a bit of the blackcurrant into the bottom of a wine glass and top with chilled white wine. Feeling bubbly? Make a kir royale by using Champagne instead. #(clear n2). [%image reference-image float=right width=400 caption="Gin and tonic. If you really want to gild the lily, squeeze in a wedge of lime. 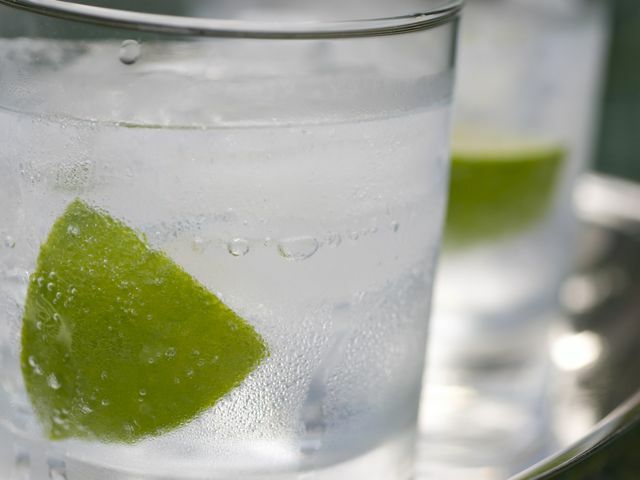 "]Gin and tonic. Culinate food editor Carrie Floyd's over-the-top version of this English favorite, The Kimmy, calls for simple syrup and mint. But all you really need is a tall glass, ice cubes, a slug of gin (we like Bendistillery's Cascade Mountain Gin, made with local juniper berries), and cold, sweet tonic water. A wedge of lime is optional. #(clear n3). Pimm's. Traditionally served at Britain's Henley Regatta, the Pimm's Cup, with its slices of strawberries and cucumber, is another English summertime classic. Again, though, the essentials are nothing more than a generous pour of Pimm's No. 1 over ice, topped off with fizzy lemonade or ginger ale. #(clear n4). Campari and soda. Grab a small glass, fill it with ice, pour a shot of the bitter citrus liqueur called Campari, and top off with cold soda water. Now pretend you're lounging on the Spanish Steps, and your Italian fantasy is complete . . .
#(clear n5). . . . unless you'd prefer to have a Bellini while sitting at a café table in St. Mark's Square in Venice. This is basically an Italian twist on the kir, using peach purée or peach juice in place of the blackcurrant and prosecco or cava in place of the white wine or Champagne. #(clear n6). Shandy. A shandy is nothing more than a glass filled half with cold, light beer, such as pilsner, and half with lemonade, sometimes sparkling. The Polish twist on this drink is to use peach juice instead. Don't knock it till you've tried it. #(clear n7). Hibiscus limeade. Steep a strong pot of tea from dark-red hibiscus flowers (available in Hispanic grocery stores, labeled "jamaica"). Chill the tea, then add simple syrup, the juice of one lime, and cold water to taste. Pour over ice and a shot of rum. Very Caribbean. #(clear n8). Licuado or batido. These are the competing Spanish-language terms for what is essentially a very liquid smoothie made in a blender (a licuadora or batidora). Put chunks of your favorite fruit (frozen is best) into a blender, add booze (plain vodka is good, since it lets the fruit flavor shine through), sugar, and water or milk, then blitz — the machine, that is, not yourself. Pour into a glass, add a straw if you have one, and kick back.